What are the benefits to writing a Final Reflective ePortfolio? Why can’t a studying Teacher Librarian (TL) listen, read about, absorb information, successfully complete assignments and then be set free into the world of Teacher Librarian-hood? (Yes, I made that up!) Shouldn’t TL’s intuitively implement effective change as they have been instructed on the theory of being an inspirational digital leader and library manager and naturally transform theory into great teaching practice? ETL401 stressed learning happens as students (not just in my classes but myself included) are actively involved in a systematic progression of creating meaning and knowledge and that it is the process of learning that is of importance, as these skills are transferable to other learning contexts and not always as significant as the actual content, which can be researched and found on the Internet at any time (Purcell, 2010). Thinking back on my second blog post, (which makes me laugh and cringe): Avatar – Isn’t this a movie?, where I genuinely learned that an avatar was a digital image one used to represent themselves and not just a movie title; I realise how crucial it was to record and take the time to reflect on my learning because it has reminded me about how much I have achieved and empowered me to recognise my strengths and weaknesses. Thinking reflectively is essential to developing a questioning attitude, identifying areas for change and improving and applying what you have learned, which ultimately benefits the students (Turner, Reid & Shahabudin, 2011). Sammy’s Scribblings, my reflective blog, has been a learning process that has been personally challenging. ETL523 Final Blog Reflection was the most successful blog entry in terms of mark and my ability to explore a deeper reflective understanding of learning, which I based around Lindsay’s three simple steps - screenshot below (2016, slide 16). Having analysed some suggested educational literature on the format and structure of a portfolio (Gathercoal, Love, Bryde & McKean, 2002; Heath, 2002; Lorenzo & Ittelson, 2005; RMIT, 2016; Woodward & Nanlohy, 2004), I have decided to create this e-portfolio to challenge both my digital and reflective writing skills, even though a word document would have been easier. It has been challenging to place concepts and learning under each of the above themes because they often over-lapped. Interestingly, the prevailing theme has been TL as leader. 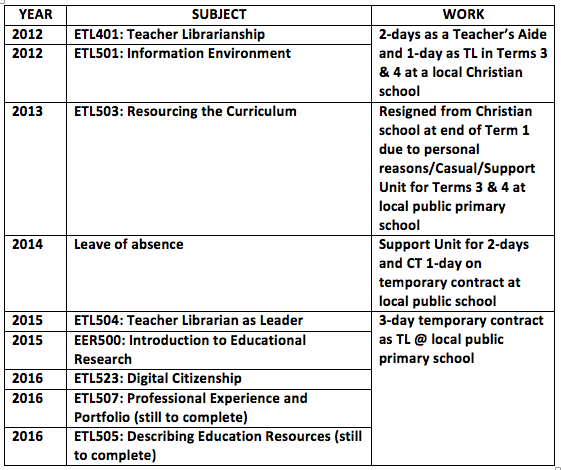 ​Summarised below is my subject schedule and workplace commitments as this has impacted on my study and ability to implement change. My role as TL in 2012 was purely teaching. I had no involvement in the circulation, management, learning environment and purchasing of print or digital resources as there was a full-time librarian employed to oversee the K-12 library. 2015 was my first year in a public school library on a 3-day temporary contract with over 10 casual teachers filling in for the other 4-day a week qualified TL who was on sick leave. I was on my own in 2015 studying, teaching and running the Learning Centre (LC).